SAILORS BACK ON DRY LAND AFTER TRAINING TRIP. Orkney youngsters are getting used to life on shore once again after a 10-day voyage aboard the tall ship Prince William. Fresh from their passage from Dundee to Denmark - before the return leg across the North Sea to Aberdeen - all agree that they have enjoyed the adventure of a lifetime. Orkney Enterprise decided to offer four places on a youth voyage operated by the Sail Training Association as a way to boost the personal development and team working abilities of Skillseekers and Modern Apprentices. Sebastian Eunson, Emma Grieve, Aimee Stevenson and Christopher Vines successfully applied for berths on board the Prince William after telling the Kirkwall-based development agency how they hoped to benefit from the experience. "I thought it would be brilliant, but it was even better than I had expected," said Emma, 18, who worked for two years at the Pickaquoy Centre in Kirkwall on the Skillseekers programme. "It was a once in a lifetime experience, I made so many new friends and it will be such a great thing to have on my CV when I apply for jobs or to go to college." The voyage aboard the twin-masted brig - the newest vessel in the Sail Training Association fleet - also gained Emma a Royal Yachting Association `Competent Crew' certificate and will help her achieve a gold Duke of Edinburgh Award. Like all the 16 to 24-year-olds among the 64-strong crew, the Sanday teenager had to climb high into the rigging of the Prince William. "You climb out along the yards with thin ropes under your feet," she added. "You are wearing a safety harness, but it is still pretty scary. I would love to go again though." For 20-year-old Christopher, who is about to start his third year of a Modern Apprenticeship in agriculture, the voyage was an opportunity to do something very different to work on the family farm in Shapinsay. "I saw it as the chance of a lifetime," he said. "It has changed the way I look at things - it was absolutely brilliant." "You gain a lot of confidence when you have stood up in front of more than 60 people and talked about yourself," Christopher said. "It is good, too, that you have to use your own initiative to get the most out of the trip and make it as enjoyable as possible. "I will never forget being out on the yards at the top of the masts. You feel as if you are floating above the sea - there is a great thrill in an experience like that." Sixteen-year-old Sebastian Eunson jumped at the chance to spend time aboard the Prince William: "I am joining the merchant navy as a trainee deck officer in September so I thought a trip on a tall ship would be a great experience for me." 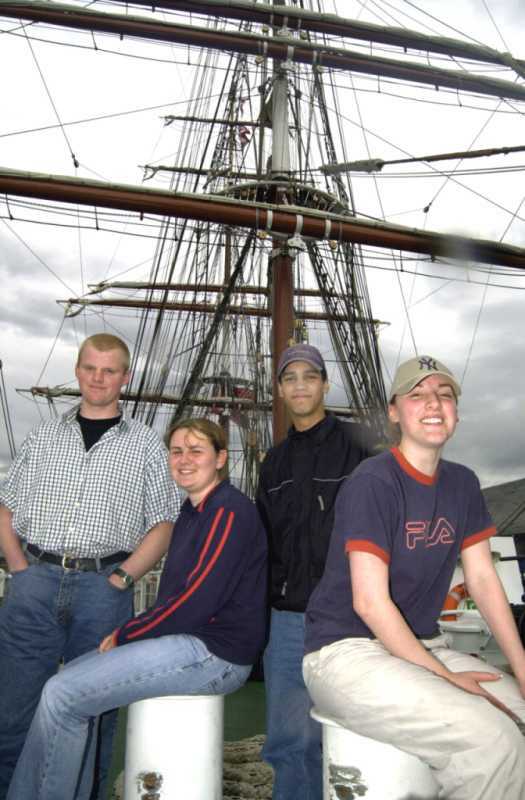 Sebastian, whose time as a Skillseeker led to a summer job at a Kirkwall bakery, describes life aboard the tall ship as a mixture of fun and hard work. Being woken in the middle of the night to take a turn on watch fell into the hard work category - but it was an invaluable part of the adventure for a teenager planning a career at sea. Aimee (20), a Skillseeker planning to take a college course in business studies, enjoyed life on board the Prince William and the time the youngsters spent ashore in Denmark - where temperatures reached a record breaking 35 degrees centigrade. "I only knew one other person when I went on board. I made a lot of friends and I would feel a lot more confident about doing something like that again," she said. Doreen Rendall, Orkney Enterprise's development manager, said she was delighted that the four youngsters had gained so much from the venture, which cost the agency around œ4,500. "We wanted to offer them a totally different experience and thought it would be really good to give youngsters from Orkney an opportunity like this," said Mrs Rendall. "We thought it would be particularly good for Skillseekers and Modern Apprentices because the voyage involved team building and the need to be able to get on and work alongside other young people - skills they can use in their working lives."